Well, the snow was relatively late coming to Cape May this winter and, so far at least, its been pretty gentle on us here, but it has certainly been cold enough for over a week now to freeze the ground up and make feeding difficult for some of our wintering birds. Once these conditions set in, however, it creates the perfect opportunity for you to wrap up warm and get out looking for American Woodcocks. In an ideal winter, woodcocks spend the day sitting quietly in lightly wooded areas, where their amazingly cryptic plumage makes them invisible to all but the most diligent searcher. At dusk, they fly out from cover to feed on damp, muddy ground in fields, meadows, even along roadsides and in gardens. But when the big freeze up comes, feeding opportunities for woodcock become very limited, as many of the invertebrates hide deeper below ground, or simply become impossible to get to in the rock-hard, frozen ground. For woodcocks, the easiest way around this is to seek out the few remaining unfrozen locations - where would this be? Well, salty water freezes at a lower temperature than sweet water, and we put a lot of salt on our roads when there is ice around. Put these two together and you soon work out that the most readily accessible, unfrozen areas around Cape May at the moment, are on roadsides. A quick drive around your neighborhood should soon reveal the most likely-looking spots; look for damp patches on the side of the road, away from too much disturbance; also look for places where the sun hits for much of the day and warms the ground a little - the north side of an east-west road can be ideal. Now that you have your spot, what do you look for? Well, this is where the search image in your head comes in. Look at a picture of an American Woodcock in any field guide and you will see a perfect portrait of the bird - but that's not how you will first see them in the field. You need a search image, an image in your brain that you can carry with you and which your eyes will match. 'Ca-ching', there it is and the rest falls into place around it. So what is the search image for a woodcock? Well, it's likely that it will be different for some people, but for me, I home in on one of two things: the rusty-orange flanks, or the bars on the top of the head. Somehow these two features never quite seem to blend in with the surrounding landscape as perfectly as the rest of the bird and are almost always my first clues to a woodcock being present. So, practice on a few photos in books or magazines; don't take in the whole picture but think about the parts that make up the whole. What strikes you as standing out from the crowd? Hold that image and take it with you next time you go out, and check those roadsides - some words of warning though: remember there may well be other cars on the road so be careful and be safe; also, remember that these birds are struggling on the edge in current difficult conditions. Always keep a respectful distance from the birds and never flush them. Sometimes they can be very approachable because they assume you can't see them because of their cryptic plumage; take your picture quickly if you have a camera, then back off quietly. The proof of success for you should be that the bird is still there when you leave. Here's some pictures from this weekend in Cape May. American Woodcock on Sunset Boulevard this weekend. The paler, orangey underparts contrast with the darker, mottled upperparts to create counter camouflage in the same strategy used by many fish species. It creates an image contrary to what we expect, since light generally comes most strongly from above and therefore the lower parts of objects are usually in shadow - and thus darker. All of a woodcocks colors are typical shades of the winter woodland floor, but that solid block of orange creates a good search image for you [photo by Mike Crewe]. Another American Woodcock on Sunset Boulevard. 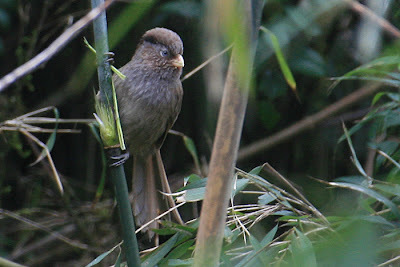 When seen head on, as in this feeding bird, the cross bars on the head seem contrary to the rest of the plumage and create a useful search image for me - two thick, dark brown patches with a pale line between [photo by Mike Crewe]. This bird was on Bayshore Road this weekend. Here we have a different, but still very distinct search image - a strong dark area with two, bright straw-colored lines across it. Rather different to a typical woodcock... [photo by Mike Crewe]. Here on Sunset Boulevard, again that solid dark area with pale, straw-colored lines. This is your search image for Wilson's Snipe, a close relative of American Woodcock. Snipe will also switch to roadsides during temporary freeze-ups, though more typically they are birds of well-vegetated wetlands [photo by Mike Crewe]. Wilson's Snipe are very flighty and usually it is best to give them plenty of space. Just occasionally though, you get one that trusts its camouflage and you get a rare opportunity to get awesome views of this fascinating bird. In this close up, the dark back pattern with pale tram lines can be seen more clearly [photo by Mike Crewe]. Talking to Will Kerling is always a great experience and a great way to get the old gray matter going on a cold day, since we always seem to pose each other questions for which we don't have an immediate answer. Will of course had been out looking for butterflies and, though this winter has not seen the amazing number of Orange Sulphurs that we saw last winter, the run of mild weather had been producing some interesting sightings. Very high on the list of these was a report of an American Snout in Belleplain State Forest recently and an American Lady, photographed by Sam Galick at Cape May Point State Park on January 19th and, it seems, representing the first-ever state record for this species for January. 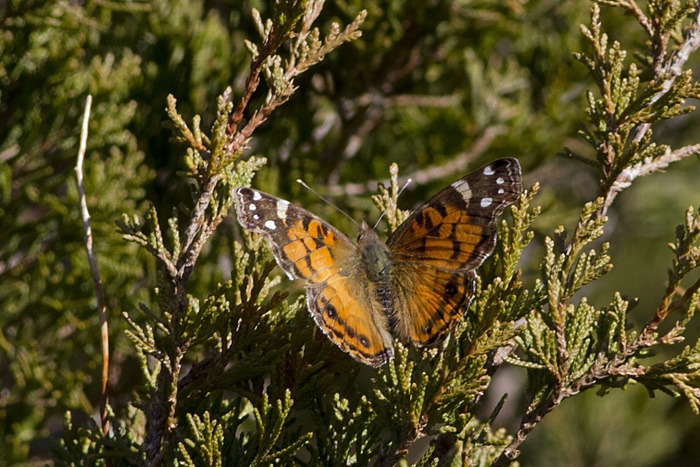 Butterfly species have various strategies for surviving cold winters; some over winter as eggs, some as larvae, some as pupae and some as hibernating adults. Yet other species survive cold northern climes simply by heading south or - even more drastic - by allowing northerly individuals to perish and re-populating an area from the south each spring. Thinking about these various options, the most likely species you might expect to see during a relatively warm spell in winter are those that hibernate as adults; they simply need to be woken up by warmer temperatures and venture out to find something to eat. American Ladies fall in perhaps the next most likely category - those that perish in the north and repopulate from the south (though at least some seem to head south in the Fall too, so it's a kind of don't-put-all-your-eggs-in-one-basket species). Thus, Sam's American Lady seems most likely to have been a survivor from last year that hung on due to the mild winter we are having. Having said that, there are some obvious questions to ask, one of which might be - what has it been feeding on? 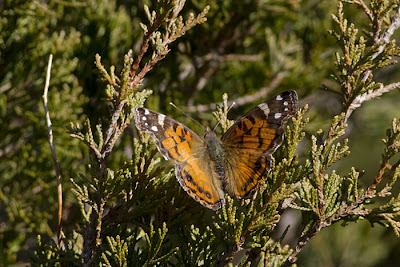 American Lady at Cape May Point State Park, January 19th [photo by Sam Galick]. A few days ago, Laura Jacobs alerted me to an American Oystercatcher that she had just seen at Reeds Beach. This might not seem too great a revelation, given that New Jersey seems to be hosting a crazy set of European birds (Northern Lapwings, Pink-footed Goose, Barnacle Goose), as well as an as-yet-inexplicable arrival of Crested Caracaras, and yet it is certainly intriguing. I quickly recalled that I had indeed seen an American Oystercatcher there myself a couple of weeks ago and hadn't thought any more of it, but Laura's email came just shortly after a longer communication from Tony Leukering, which also brought news of shorebirds on the bayshore. During the winter, shorebird distribution is largely influenced by the availability of food (as you may well imagine) and the availability of food is more often than not influenced by weather. Most North American shorebirds head well south for the winter, with many wintering around the shores of the Caribbean, while others head way down into South America - even as far as Tierra del Fuego in the very south of Argentina and Chile. In milder winters, however, shorebirds will often stay further north, and this has certainly been the case this year, with Sam Galick reporting some 80 Western Sandpipers and Stone Harbor Point for example and, just yesterday, I counted some 40 Greater Yellowlegs in the tidal creek at Beaver Dam, South Dennis. During milder winters, so-called benthic invertebrates - those creatures that live in that strange world somewhere between solid mud and water - remain nearer the surface and survive the winter in greater numbers, thus providing more food for wintering shorebirds. But mild weather doesn't seem to fully answer what is happening this year; Tony Leukering's sightings along the bayshore in Villas have revealed numbers of birds that one might expect on the Atlantic coast, at Stone Harbor Point or Two-mile Beach for example, but certainly seem surprising along the bayshore, where sediment - and thus feeding opportunities - are different to those on the coastal side of the Cape May peninsula. Tony's recent note reported 136 Black-bellied Plovers, eight Ruddy Turnstones, 12 Red Knot, six Sanderling, two Western Sandpipers and 250 Dunlin at Miami Beach, an impressive haul for the bayshore. It will be interesting to see how these numbers might change with a run of colder weather now settling in and we can only speculate at present as to why these birds are favoring the bayshore, but it is not beyond the realms of possibility that sediment shifts caused by Hurricane Sandy may have altered the bayshore ecology and it will be interesting to see if this continues into May and the all important horseshoe crab spawning season. 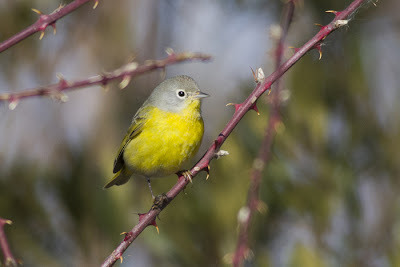 Sightings over the past few days have continued to be focused largely on the interesting array of wintering birds at Cape May Point State Park, most of which continue to be reported periodically, including the Townsend's Warbler and the White-eyed Vireo. A Yellow-breasted Chat appears to be wintering at Higbee Beach and the male Western Tanager continues at Cape May Court House (though I am up to seven visits and still no sighting of this bird yet!!!). 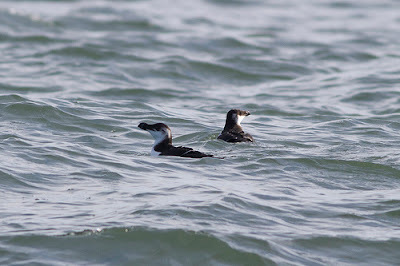 Other long stayers include the King Eider, which wandered up to Higbee Beach and back to St Mary's and the Western Grebe in Cape May Harbor off Delaware Avenue. An adult Black-headed Gull is currently wandering anywhere along the bayshore between the Cape May ferry terminal and Norbury's Landing, Del Haven, a Vesper Sparrow was reported by Don Freiday from the Cape May NWR at Green Creek on 21st and a flock of eight or nine Red Crossbills, reported as type 10, was at Cape May Point on 20th. Further afield, a Cackling Goose was along River Road, just north of the Cohansey River in Cumberland County on 20th and a Short-billed Dowitcher was photographed with Marbled Godwits and Western Willets at the Brigantine Island shorebird roost, just north of Atlantic City on 21st. 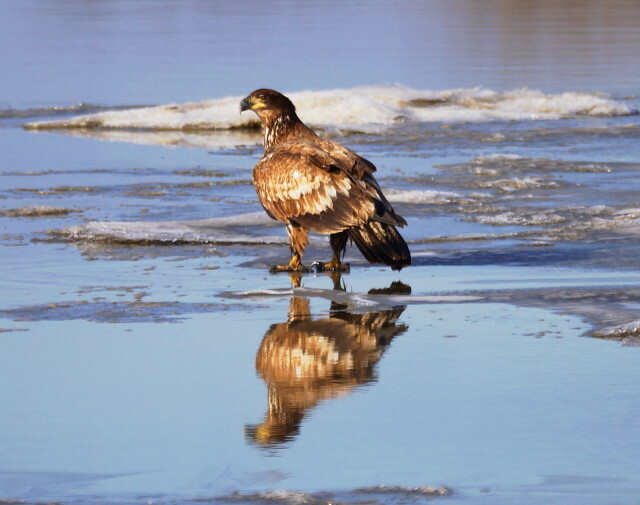 Golden Eagle and Eurasian Wigeon were reported on 19th from Corbin City impoundments, but note that currently it is only possible to walk in to this location, due to damage from Hurricane Sandy. Just this week, news has filtered in to me of caracara sightings from Cape May (Cape May Co.), New Gretna (Burlington Co.), Estell Manor (Atlantic Co.) and Woodstown (Salem Co.). At first, the few sightings could just about be written off as a single, wide-ranging individual, perhaps locked in with a wandering band of Black Vultures. However, as more sightings come in and dates look like they are starting to clash, it looks as though we may well have two and maybe even three birds in New Jersey. 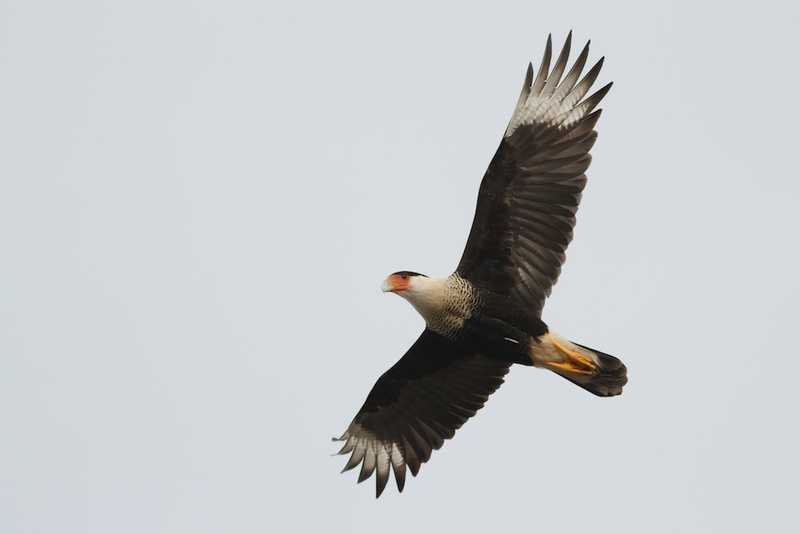 To try and resolve this, I would like to encourage anyone who believes they have seen a Crested Caracara in New Jersey in the last three months or so - and especially this month - to contact us and let us know; ideally we would like to know location (as precise as possible) and date. 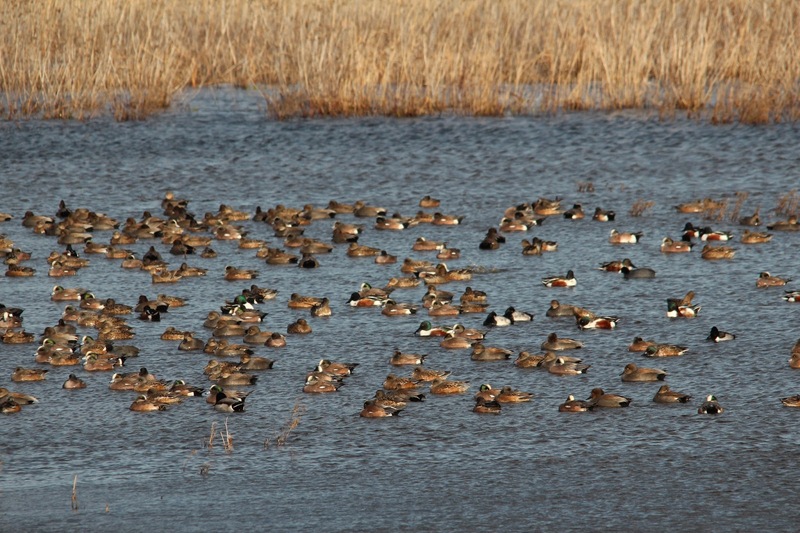 All details will be passed on to the New Jersey Birds Records Committee. Of course, we would be really keen to receive digital photos of your birds, as there may be subtle plumage differences visible which would be of great value in assessing how many birds may be involved. While we all get very excited, of course, at the prospect of ticking this great bird off on our lists, I have to say that it is starting to look a little peculiar. Ideally, it would be nice to see a pattern of sightings of wandering birds appearing on eBird, with sightings starting, for example, some time last summer and showing birds moving north up the mid-west, east through the Great Lakes region then turning up on the East Coast in the Fall. Unfortunately, all we currently get is an isolated rash of sightings in New Jersey and none anywhere else; you have to go way back to 2011 to get a bird in Colorado in July, then one in Kansas in August. Could this one bird really have headed our way and stayed hidden until September 2012? But then, what else is happening? None of the sightings have involved banded birds. Were these an illegal shipment that got released somewhere locally? Or did they escape from a licensed owner during one of the many storm events that we have experienced over the past 12 months? Maybe we will never know, but adding as many confirmed sightings as possible to the map may help to understand how many birds are involved, and what they are doing. If you want to contact me about this subject, please feel free to do so, using the link in the left hand column of this page. Crested Caracara photographed this morning (17th) on Rt 603, Alloway-Woodstown Road, Salem Co. Poor light at this time of year may not produce the best of portrait shots, but it is very easy to see that this is certainly a Crested Caracara - but is it the Cape May bird? Or the New Gretna bird?! Apparently, a caracara was seen in the Woodstown area on January 4th, so this bird may have been in Salem County for some time [photo by Becky Clanton]. 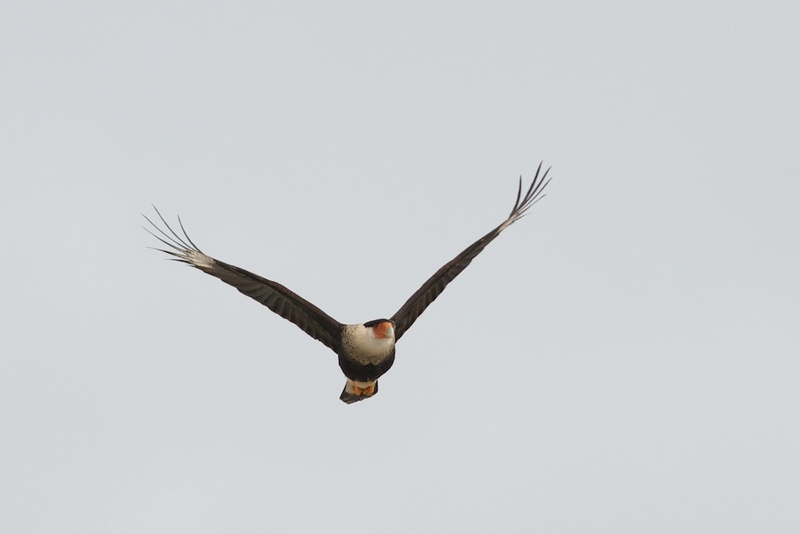 In flight, Crested Caracara shows long wings and a heavy head, with a distinctive distribution of white on the neck, tail and in the primary bases, with the rest of the bird being dark. On the ground they can look chicken- or turkey-like and are thus more like vultures than other birds of prey in that respect. Also like vultures, they regularly forage for road kill - so keep a camera in the car, a picture speaks a thousand words! 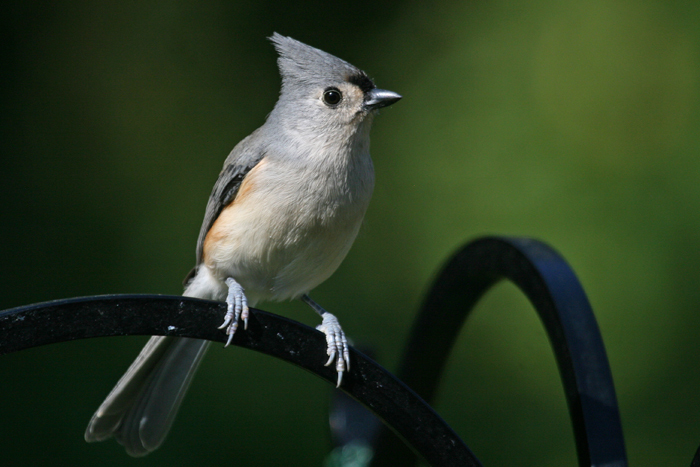 This is the Cape May bird, photographed on 12th [photo by Mike Crewe]. Google map of South Jersey. 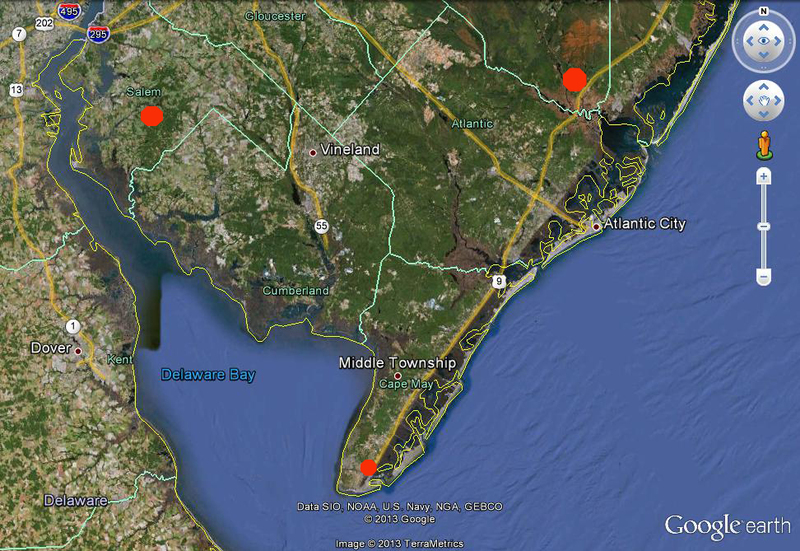 The red spots show the three recent caracara locations that we know of - let us know of your South Jersey sightings, wherever they may have been made! Fog and birding don't mix! Of all the obstructions that the weather can throw in the way of our birding enjoyment, I guess fog is the most successful when it comes to making life difficult! Windy days can be really annoying as you wrestle to hold optics still and anything smaller than a swan hides in the undergrowth; rainy days can be frustrating, but can often be beaten by using the car as a mobile blind. But fog? Well, I guess you can listen to stuff! We had a foggy weekend this past Saturday and Sunday (followed by three days of drippy rain) but, despite this, we nevertheless had a pretty successful two-day workshop, looking at whatever we could find during breaks in the weather. The fog put paid to our usual schedule of studying wintering ducks, cormorants, gulls and the like, but Cape May came good with a great selection of birds to enjoy. 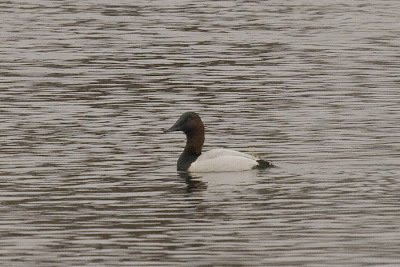 Duck numbers remain good on the freshwater ponds around the point and we were able to add a freshly arrived male Canvasback to our lists on Bunker Pond. The two male Blue-winged Teal seem also to be hanging around, as is the first-winter male King Eider off St Mary's and the Western Grebe in Cape May Harbor. 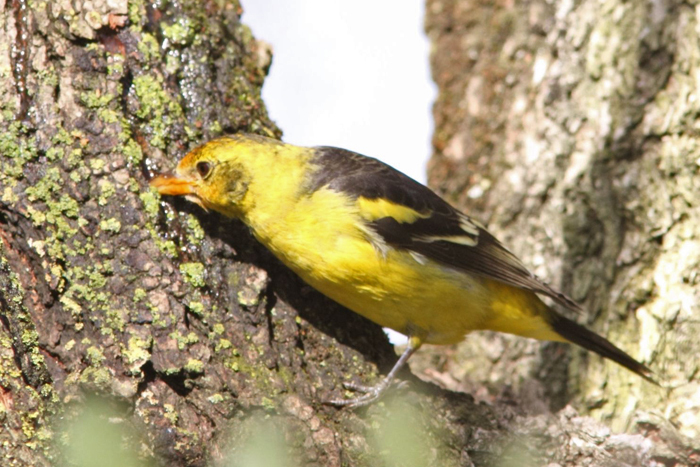 In the state park, Nashville and Townsend's Warblers continue (though elusive) and a Pine Warbler was seen on 12th. A Yellow-breasted Chat was on Bayshore Road by The Beanery on 13th. Both House and Winter Wrens are also around - the former favoring the area by the brown gate along the northern side of the property. Occasional reports of Baltimore Orioles have come in from various locations and I'm told that the Western Tanager continues to visit sapsucker holes on Hand Avenue in Cape May Court House - though personally I have so far been five times now and still not seen it!! A juvenile Northern Goshawk continues to terrorize birds in the state park though, as always with this species, remains amazingly elusive and hard to spot. On Sunday, we did manage good views of it as it flew low over the reeds on the north side of Bunker Pond and disappeared into a stand of cedars, never to be seen again! Red Crossbills look settled around Cape May Point for now (they should start breeding soon if they are going to this year) but there are occasional reports from elsewhere, including Cox Hall Creek WMA and Jake's Landing. White-winged Crossbills seem mostly to have passed through, but one or two are still to be found, though mostly on the move it seems. A single Evening Grosbeak was noted flying over Coral Avenue on Saturday morning - sadly they didn't seem to want to hang out for photos at our feeders! Beyond the magnetic draw of Cape May Point, other reports have included up to 70 Western Sandpipers, 10 Red Knot, 10 Semipalmated Plovers and a Long-billed Dowitcher in the Stone Harbor/Nummy's Island area, a Lesser Yellowlegs and the three saltmarsh sparrows (Seaside, Nelson's and Saltmarsh) at Jake's Landing and two Sandhill Cranes on Percy Blew Road in Cumberland County. This male Canvasback was a nice addition to the ducks on Bunker Pond for our Winter Warmers workshop on 12th [photo by Gordon Rigby]. Away on a wing and a prayer! The Crested Caracara was hard to pin down this weekend because of the weather, but a break in the fog early afternoon on Saturday allowed for good photo opportunities, as seen in these two great shots by Tom Johnson. It's fair to say that, like most places in temperate regions, mid-winter days can be slow for birds some times, but not this weekend it seems. The continuing mild weather is allowing recent good birds in Cape May to hang on and it really looks like a good weekend to be down here birding. As of today, the Crested Caracara continues to hang out around the Rt 626 canal bridge in Lower Township (that's the one that leads straight into West Cape May, not the one near the harbor), the Western Tanager continues at Dias Creek Road/Hand Avenue intersection in Cape May Court House, the Western Grebe continues in Cape May harbor and the Townsend's Warbler continues in Cape May Point State Park. Also in the state park, Pine, Nashville and Orange-crowned Warblers, Common Yellowthroat, Baltimore Oriole and White-eyed Vireo all appear to be around and the King Eider continues to hang out off St Mary's at the point. Two Blue-winged Teal wander between the state park and The Beanery ponds and a Cackling Goose is wandering around south of the canal, most recently reported from The Meadows. Ospreys have been a surprise this winter too, with singles most recently at Jake's Landing on 7th and Brigantine on 8th. In Cumberland County, a Red-necked Grebe has been reported intermittently from the channel at Turkey Point. This Nashville Warbler has been present but pretty elusive in the state park for some weeks now, but Sam Galick finally got this great shot as it posed briefly on a bramble stem along the main trail. The male Western Tanager continues to delight many in Cape May Court House. Here it is seen at a sapsucker hole, a habit it has taken to frequently of late [photo by Beth Polvino]. If you're further up the Delaware Bay in Cumberland or Salem Counties, don't forget that there are always great eagle viewing opportunities at this time of year. These two shots were sent to me recently by Jeff White, up in Salem County. The (Mexican) Eagle Has Landed! On Saturday, January 5th I received an email from Roland Scardino Jr, that he had seen a Crested Caracara on a treetop, near his house, in Estell Manor, Atlantic County. Now you would perhaps be forgiven for being a little sceptical of such a report - this being New Jersey and not somewhere much further south, but I was intrigued and I put the word out. Roland's brief details were nevertheless quite convincing and - here's the real clincher - there had been a Crested Caracara in New Jersey back on September, at West Windsor Township, just outside Trenton. Who knows, maybe it was the same bird. Though one or two people took a look around Estell Manor over the following days, there were no reports. That is, until Tink Bryant was heading north out of West Cape May towards the canal bridge this afternoon. "Is that an Osprey on that phone pole"? she asked her son; "No Mum" he replied, "It's a Mexican Eagle!" They teach these American kids good at school round here!! I never imagined seeing a shiny bright, adult Crested Caracara, with the Cape May Canal as a backdrop! The intense color of the bare parts and heavy black tones to the plumage indicate that this is an adult bird [photo by Mike Crewe]. Our visitor was not so popular with the local American Crows... [photo by Mike Crewe]. In flight, caracaras are distinctive, having a rather heavy head and bill and with long, straight wings and a long tail, giving the bird the look of a flying cross. Note the white wing patches in the wings too [photo by Mike Crewe]. While Crested Caracara may seem a peculiarly exotic bird to turn up in the wild here - and they are certainly kept in captivity - there has been two previous records from New Jersey, though neither has yet been fully accepted as wild by the New Jersey Birds Records Committee. However, Massachusetts has two accepted records from 1999 and 2007 so maybe things are about to change... Of interest to anyone researching extralimital records of this species, there are two Ontario records - one way back in 1893, which must surely have good credibility. Whether wild or not, this is a great bird to see - even Dave our UPS guy stopped for a quick look this afternoon! I know where Cape May's birders are going to be first thing tomorrow morning!! Oh, and why Mexican Eagle? Well, it has long been suggested that the eagle on Mexico's crest and coat of arms is a Crested Caracara, based mostly on the fact that the bird is catching a snake (typical caracara behavior). However, the eagle on the crest is usually portrayed colored brown and has feathered legs, while the base of its bill is yellow, not orange. Thus, the proud Mexican emblem is more likely to be a Golden Eagle - though why it's toying with a snake is anyone's guess! Last Sunday, the keener contingent among Cape May's birders were all aboard a boat, heading out into coastal waters to see if there were any remnants out there from the auk movements that took place in December. 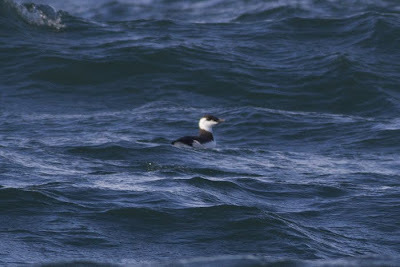 As it turned out, there were plenty of birds to be seen and all within some six miles or so of the coast. The trip took the group in a loop out of Cold Spring Inlet, circling back closer to the coast off Stone Harbor and Wildwood. 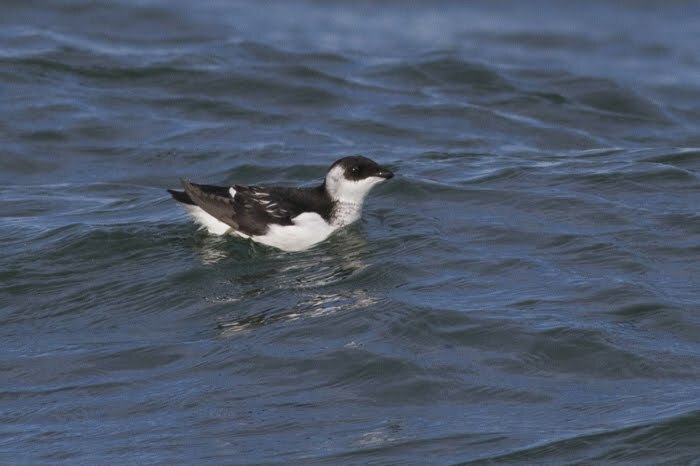 Auks were the target birds and they certainly performed, with a total of 89 Razorbills counted, along with three Dovekies and a single Common Murre - the latter a real prize for any keen Cape May birder. I suspect more trips will take place in the near future so watch this space! Other birds of interest included 28 Red-throated Loons, eight Common Loons, 94 Northern Gannets, two Black-legged Kittiwakes and three Forster's Terns. Common Murre, just a few miles off Cold Spring Inlet on January 6th [photo by Sam Galick]. Dovekies are still out there for the finding; head for the coast if strong easterlies are forecast and you might find one from shore... [photo by Sam Galick]. 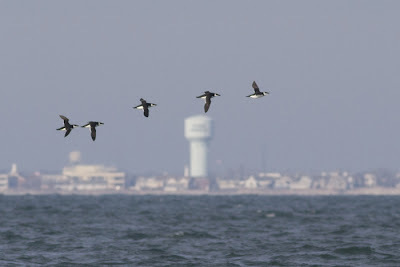 A party of five Razorbills fly by with the Stone Harbor water tower in the background [photo by Sam Galick]. If you see two Razorbills together, you might be tempted to assume they are a pair, but the truth is likely to be quite different. The difference in bill size reveals this to be an adult (left) and first-winter (right) and that is more typically what you will see. In Razorbills and some other auks, the male tends the single young after it leaves the nest site at a relatively early age. The male will lead the youngster out to an area where the feeding is good and this perhaps saves the adult from having to make repeated, long commutes between good feeding grounds and the nest site. It is not unusual for the two to stay together for much of the first winter [photo by Sam Galick]. I was out preparing for our Winter Warmers workshop today, checking a few of the less-visited spots around Cape May to see what gems were lurking out there and lining up some goodies for next weekend's two-day winter birding extravaganza. For me, there's something special about those birds that can tough out a northern winter, while being small enough to fit in your hand, and few birds seem to fit the bill as well as wintering shorebirds. While we don thermals and wrap up in extra hats, gloves and scarves, wintering birds get by with exactly the same number of feathers they wear in summer, which strikes me as pretty amazing. A small group of us checked out some great places today and confirmed what we perhaps already knew - Cape May is bristling with good winter birds right now. At Cape May Point State Park, ducks still fill the ponds and the relatively mild winter we are enjoying meant that we enjoyed some pretty surprising birds there; a Nashville Warbler, at least four Orange-crowned Warblers, a Townsend's Warbler and a White-eyed Vireo were all showing well today and were all hang-overs from the back end of 2012; I hear that the wintering Common Yellowthroat was seen today too. A Virginia Rail showed well briefly in the morning, while nearby, the wintering Blue-gray Gnatcatcher was reported from the side yard of 304 Oxford Avenue yesterday. The two Collared Doves continue - but remain a little elusive - around Harvard/ Whilldin/ Lincoln Avenues and an Evening Grosbeak flew all too briefly over Lake Lily on 5th. While Cape May Point remains the best place to look for wintering Red and White-winged Crossbills, a group of 8-10 White-wings was seen just north of Norbury's Landing on the bayshore today, so crossbills are certainly worth looking for elsewhere. Our wanderings in search of goodies for the workshop produced a fine suite of great Cape May winter birds, all under a cloudless sky (a day so glorious that I got my first butterfly of the year - a Red Admiral!). Searching shorebird habitats provided Western and Purple Sandpipers, Long-tailed Ducks and Common Loons were plentiful and we notched up at least five Great Cormorants. Among large groups of Greater Scaup and Buffleheads, the bayshore side of the peninsula gave us a couple of female Common Goldeneye, with the persistent barking of Snow Geese as a wonderful background sound to a glorious winter sunset. Come and join us next weekend for a great blend of learning and pure, unadulterated enjoyment of some great winter birding. A great start to any day, this adult Red-shouldered Hawk has brightened my drive to work for the past two mornings; Red-shoulders are rare breeders in Cape May County, but are more common as a migrant and wintering species. Many of the wintering birds are lovely, rusty-marked birds like this one [photo by Mike Crewe]. Not the best of pictures, but this quick grab in the shade of a stand of red cedars shows that the Townsend's Warbler is still hanging out in the state park, though it remains rather elusive and hard to track down [photo by Mike Crewe]. Common Loons are plentiful around the coasts and backbays at the moment, offering great opportunities to sort them out from nearby Red-throated Loons [photo by Mike Crewe]. Always a nice find among the large flocks of Dunlin and Sanderling on the beaches, Western Sandpiper can be a tricky species to find at times. These three were a real highlight of a sunny day today [photo by Mike Crewe]. The turn of a New Year always gets me into that age-old routine - starting a new year list. I first kept a year list in 1975 (I know, old or what?!!) and believe it or not, I have kept one every year since then. But dwelling on this last night, led me to think not about the whole issue of year listing, but about starting out. Not just starting a year list, but actually starting birdwatching. For me, it was a very different process to most people - I never actually made the decision to 'start' birdwatching, I morphed into it at such an early age that it just became part of life for me. Thus, I have never really known what it must be like to decide to take up birdwatching - though I probably came close on some of my past trips to places like southern Brazil or the Eastern Himalayas - where you wake up on the first morning and have absolutely no idea what any of the sounds are that you can hear! However, having been privileged to spend a large chunk of my life leading walks, workshops and tours for birders, I have gained an idea of just how daunting - even intimidating - that first day can be. For me, there was little help at hand and I took whatever leads I could get to help me, but for people these days, there are any number of outlets and, indeed, perhaps now there are so many offers of help that those offers in themselves become daunting!! Well, help really is at hand - and soon! February sees the start of a new workshop, put together and run by our very own Pete Dunne. Break Into Birding is a two-day workshop on February 16th and 17th and offers a great opportunity to get together with like-minded folks. The workshop is based on a very popular session that Pete has run in the past and is backed with many years of practical experience. Now, if you are already a regular reader of our blog, you may feel that you don't need to take a beginners course - but such a course makes an ideal gift to give to a partner, relative or friend - someone to share a lifetime passion with. For more information about this great course, contact Chris Tonkinson at (609) 861-0700. 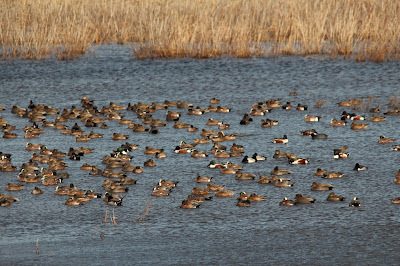 But for now, here's a fun thing to ponder over a hot coffee - how many duck species can you find in this picture, taken at the state park recently by Kimberley Meszaros (click on the picture for a larger version). Though it feels pretty darn cold at Cape May at the moment, with temperatures ranging from 27F to 37F over the past 24 hours, it's fair to say that - so far at least - we are having a very mild winter and this is certainly being reflected in the birds that have been found over the last couple of days. I ran into Jimmy Dowdell at the state park yesterday and learned that he had found no less than five species of warbler that morning, a sure sign that there is insect food still to be found along the wetland edges. The Townsend's Warbler is still being seen intermittently, but is highly mobile and there is no foolproof way to be sure of connecting with it. It ranges from Yale Avenue in Cape May Point to the state park and, within the park, it may be found anywhere from the entrance/parking lot area right through to the 'back gate' which most people are familiar with at the far end of the longest section of boardwalk. The other warblers being seen include Orange-crowned, Nashville and Yellow-rumped Warblers and a Common Yellowthroat. Yellow-breasted Chat was also reported from West Cape May on December 23rd and a very unexpected Blackpoll Warbler was reported by Don Freiday from Cape May Point on December 24th. Other unseasonable birds have included the two Western Tanagers which continue in Cape May Court House, a Swainson's Thrush, found by Rob Fanning at Cape May Point on 24th and a Black Skimmer past St Peter's on December 23rd. There are quite good numbers of Fox Sparrows rummaging around in the leaf litter in the drier parts of the state park, as well as Song, Savannah, White-throated and Field Sparrows there, while Tom Reed reported an American Tree Sparrow in his yard on Reeds Beach Road today - the first I have heard of this winter I think. A White-eyed Vireo was a remarkable find in the state park on December 22nd and may well still be in the area as it has been elusive but seen several times since then, to January 1st at least. A Northern Shrike was in Del Haven on Christmas Day, last being reported on 28th and a relic of the Evening Grosbeak invasion involved a single bird briefly in Bottle Creek Drive, Cold Spring on December 31st. The Dovekie invasion fizzled out a little - though there may yet be more if the weather turns rough again - but singles were noted at the ferry terminal on 27th and at Stone Harbor Point on 31st. It may well be worth looking out for Iceland Gulls, as recent sightings have included singles at Shellbay Landing on December 27th, south past Del Haven on January 1st and on the beach at Cape May Point on 2nd. The latter bird was watched flying away up the bayshore, carrying on north past Sunset Beach at least. All sightings involved first-winter birds. Finally, a Yellow-headed Blackbird was seen briefly in a mobile grackle/blackbird flock along Bayshore Road near The Beanery on December 30th and should certainly be looked for. Oh and both Red and White-winged Crossbills and Red-breasted and White-breasted Nuthatches seem to be permanent fixtures around the point, for now at least, so keep an ear and an eye out for these. First-winter Iceland Gull at Cape May Point today. Gentle-faced, kindly-looking gulls that are always a really special find. Note the mostly dark bill with just a smudgy splash of pink at the base and the subtle markings on the primary feathers [photo by Mike Crewe]. What a place! 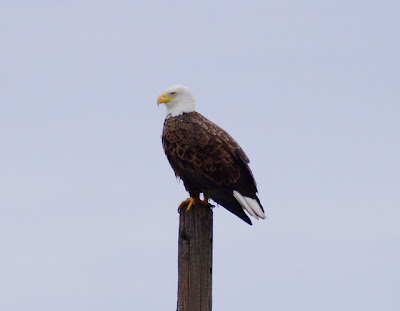 One thing we were short of at Cape May for a long time was resident eagles. But now we have them and I forfeited the chance of several nice 'year ticks' before work this morning when I chose to get up close and personal with our local 'south of the canal' pair. These two were sitting in a small oak which was barely big enough to support their weight at the state park and were just asking to be photographed. Though the relative body angles make judging size difference tricky, the bigger head and bill of the bird on the right marks it out as the female [photo by Mike Crewe]. Ring out the old, ring in the new - in fine Cape May tradition, we started 2013 with our Kick Off Your Year List walk and turned up a great selection of birds. Our walk began at Cape May Point State Park with scoters, Long-tailed Ducks and Northern Gannets ferrying offshore and a great selection of ducks on the state park ponds, the best of which was the female Canvasback that has been around since last year. Two Great Blue Herons and a Great Egret were nice additions, as was a Belted Kingfisher and a smart male Red-breasted Merganser - the latter an unusual visitor to Bunker Pond. Bald Eagles are, of course, pretty much guaranteed here now, but it was still nice to see one of the resident pair, cruising along the back of Lighthouse Pond. Our walk took us around part of Cape May Point, where we added the male King Eider and some very obliging Red Crossbills to our list. Yard feeders added Carolina Chickadee, House Finch, Mourning Dove and several female Purple Finches, and brief glimpses were had of Downy and Red-bellied Woodpeckers. After a welcome lunch and warm-up, we met up again at the Nature Center of Cape May for great views of the Western Grebe that now looks set to spend the winter with us in Cape May Harbor. Here too were Brant Geese, lots of Buffleheads, Ruddy Ducks, a close Common Loon and a very distant Boat-tailed Grackle. Winter afternoons are always all too short so we made a hasty visit to Two-mile Beach for American Black Ducks, Sanderlings and a Great Cormorant, then headed to Sunset Lake in Wildwood, where a feeding party of Greater Scaup and two very close Horned Grebes were our reward. Our day was nicely rounded off with a last minute visit to Sunset Beach, where at least four Merlins and a male Northern Harrier were seen before they headed for their night roost. It was a cold and rather gray day, but we ended with a total of 77 species - certainly a good start to the year - so how about we see how many species we can notch up on CMBO events this year? Come and join in and be part of the fun!! The immature male King Eider continues to hang out around the jetties off Cape May Point and can usually be found somewhere between St Mary's and St Peter's [photo by Mike Crewe]. 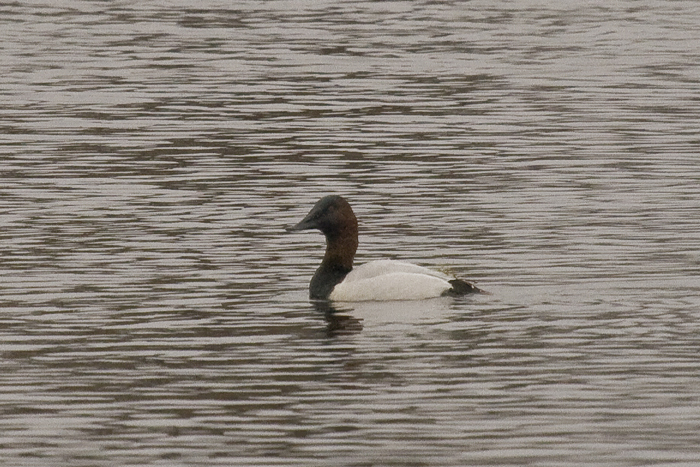 The female Canvasback was on Bunker Pond on Christmas Day, but on January 1st had returned to the third Plover Pond - to date its favorite location [photo by Mike Crewe].